Friends and family probably don’t think of me as an emotional person. Yet I do not by choice read books or watch films where the dog dies. I don’t like it when the dog dies and that is why we don’t currently have a dog (or cat, as it turns out I don’t like it when the cat dies either). Despite that, in general I maintain an even keel rather than going through extreme highs and lows of emotion. But one thing that does get through the leathery outer carapace is the ability of certain moments in live classical music to stir my soul. I suppose that’s why I go to concerts. As I sit there, at the start or at the end of the programme , the old question about the tree falling in the wood often occurs to me. If no-one knows that I went, and over the years the sands of time obscure my own memory (in my case it takes about 10 days of sand for the memory to be pretty much obliterated – on bad days, 24 hours), then did I ever go? Or did it matter that I went? Increasingly I feel that going to something that was genuinely moving is only meaningful if I write about it afterwards. And probably on this blog, since it is my hope that these notes might occasionally prompt readers to see and hear things that I think are genuinely life-affirming. So that is why dear reader, instead of the next thrilling installment of the Asus Transformer Keyboard story, you are reading with some bafflement, a description of a lunchtime concert today, at St James’s Piccadilly, in London. A programme of solo piano pieces played by the veteran Argentian-born maestro Alberto Portugheis (you feel he should have at least been Brazilian), this included Beethoven’s Pastoral sonata op28, as well as pieces by Carla Maria Von Weber, Debussy, Mendelssohn, and Chopin. Reverting back to Transformer keyboard topics for a moment, I have to record that the excellent Thumb keyboard auto-completed ‘Beethoven’, ‘Debussy’, and ‘Mendelssohn’ for me – each after 4 letters. Someone with taste clearly compiled the dictionary. There is something about French music from the Fin de siècle to the onset of the second world war that strikes an powerful emotional chord with me. Whether the Hot Club of France, or Debussy, Ravel, Poulenc, Satie, or Milhaud, they all have a sweet, quirky, elegaic, never-to-be-recovered air. And some are unbearably moving like Ravel’s ‘Pavanne pour une infante mort’, or Debussy’s ‘Claire De lune’ from the Suite Bergamasque. It was the latter that Portugheis played today. A few years I used it in a video to remind my mother of her days in France, sadly never to be repeated. That alone made it poignant, but the theme of “melancholy moonlight, sweet and lone”, from the poem by Paul Verlaine is by itself extraordinarily evocative. Portugheis, at 70 is a serious man – a piano virtuoso, teacher, and tireless antiwar campaigner, he was a Nobel peace prize nominee in 2008. He played Claire de Lune with huge tenderness as the expression of a lifetime of experience, not all of it good. I found it inexpressibly moving. I could have died then, and felt I understood something, and at the end of the piece my eyes were filled with tears. The pianist sat for a few seconds, shook his head slightly, and got up to receive the applause. I wondered as he stood, if he really had the ability to evoke great emotions in his listeners, while being dispassionate himself. He sat down again, and as he wiped his eyes before starting the next piece, I realized that he had been crying too. 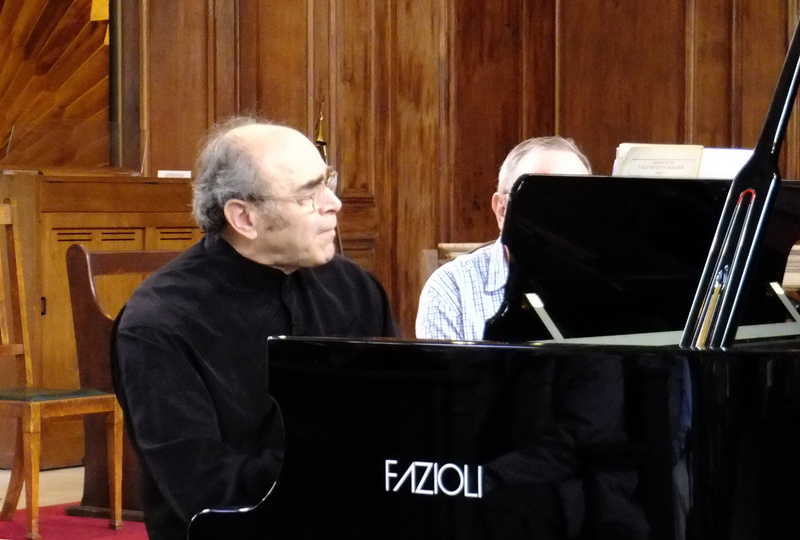 Just came across this beautiful review of Alberto Portugheis’ 70th Birthday Concert. It should be on his Wiki page as should the photo. Who is the copyright holder of this image? Excellent. Hope to hear from the writer and photographer. Thank you for your nice comment Norma, and glad you liked the piece – it was a wonderful concert. I took the photograph, and have no desire to exert any rights over it, so it and the text can be used on the wiki page – which I see you wrote. Feel free to excerpt the text – there are parts in it which would baffle a casual reader I might think.